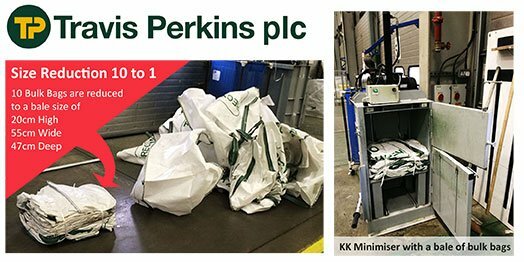 KK Balers recently supplied two KK Minimisers to long-standing customer Travis Perkins plc for internal operations at their headquarters in Northampton. Travis Perkins plc is the UK’s leading supplier of building materials and one of the largest suppliers to the UK’s building and construction market. The company can trace it roots back to 1785, and includes businesses such as Travis Perkins, Wickes, Toolstation, BSS Industrial and City Plumbing Supplies. It operated from over 2,000 outlets nationwide and employs 30,000 people. With a growing amount of materials delivered to branches from its distribution centres in Northampton, Travis Perkins needed to transport recycled materials back to its own local recycling facility, and avoid unnecessary landfill. This means more and more bulk bags being used. The KK sales team recommended a KK minimiser with a bespoke ‘in-built’ table. This allows Travis Perkins to bale the bulk bags and return them to the branches across the UK to re-use. Using the in-built table, the balers are able to compact the bags in an ideal size for transporting. Where have otherwise gone to waste, they can now be recycled for use across branches and stores, saving unnecessary cost.